Québec solidaire: A Left-of-the-Left Formation? The first decade of the 21st century has seen the rise of new ‘left of the left’ formations in several Western countries. The best known cases are the Nouveau Parti Anticapitaliste (NPA) in France and Die Linke (The Left) in Germany. These new parties share some common traits: they are based on an explicit rejection of the institutional left in their respective countries, take a good deal of inspiration from the post-Seattle anti-globalization movement and exhibit a coalition character with membership drawn from several social and political movements (feminist, ecological, antiwar, far left, libertarians, community groups). Québec solidaire (QS), though not as well-known as the NPA or Die Linke, shares a surprising number of traits with these formations. This includes a growing electoral presence which irks and worries the party fulfilling the role of the ‘institutional left’ in Quebec, the sovereignist Parti québécois (PQ). Since its founding in February 2006, QS has challenged openly and publicly the PQ’s hold on the ‘progressive constituency’ in Quebec. It has argued forcefully that labour, community groups and social movements must have their own autonomous political expression, distinct and opposed to the PQ’s ‘neoliberalism with a human face’ practice and program. Even more ominously from the PQ’s point of view, QS opposes its strategy of putting the social program on the back burner in favour of a ‘grand national coalition’ and calls for an explicit link between Quebec independence (or sovereignty) and social progress. In Québec solidaire’s own words, the Quebec ‘National Question’ and the ‘Social Question’ must be linked in a strategy of social transformation. This question lies at the root of QS’s present attempt to define its program. Following its recently held 5th congress centered on the National Question, the party will be tackling the socio-economic and environmental parts of the program. At a party school held in early fall, some of the preliminary proposals of the Political Commission going toward an anticapitalist and ecosocialist position were received with great interest by the 100 or so participants. But it remains to be seen whether these positions will gain greater acceptance in the party as the internal debates get going ahead of the next congress. Practically, the link between electoral activity and involvement in social struggles is yet to be resolved. 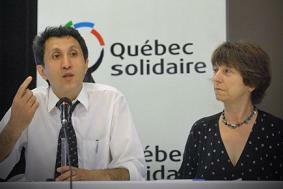 With the election to the Quebec National Assembly of Amir Khadir in December 2008, QS has made significant inroads. It is now credited with a steady 7-8% in the polls, roughly twice its result of 2008. And Amir Khadir has become a popular and recognized figure across Quebec, ranking 3rd in a recent poll of political personalities. However, the ongoing link with labour struggles and popular struggles is tenuous at best. Many activists returned to their movements after the election campaign. How will the party build on its electoral successes over the next three years, particularly outside Montreal where the left is not as entrenched? What kind of organic links can be built with labour and the social movements at a time when mass struggles seem to be ebbing in Quebec? These are open questions that QS must deal with in the coming period. A positive sign is the willingness of some of the younger labour activists to begin coordinating their actions in the trade-unions as QS gains greater recognition, acceptance (and backing in some cases) among some local and regional union officials. There are obviously some key differences between the history of the left in Germany and France and that of Quebec. Both the NPA and Die Linke must deal with the complex issues of existing social-democratic and left formations in their countries and its attendant question of electoral alliances (or not) in local, regional, national and European elections. In Quebec however, there is no history of mass labour or communist parties and therefore these kinds of tactical questions are not on the agenda. Furthermore, in the present first-past–the post electoral system, the kinds of tactical alliances that a two-stage election (France) or proportional representation (Germany) require are not an issue. However, a question that will dog QS in the near future will be its attitude toward the PQ, if that party should come back to power and call a referendum on the National Question. But that is, at the very least, three years down the road. A greater problem is the nature of the link with labour and the social movements. In Western Europe there is a long history of organic links between these movements and left-wing parties. In Quebec, despite a history of radical action by labour and popular organizations, there is no history of such organic links. The PQ has no organizational roots in labour despite its history of support from trade-union leaderships. And the NDP has never been a factor in Quebec. Thus, QS faces a dual task: wresting away sections of labour and the mass movements from the PQ and, at the same time, developing a form of organic linkage which is new to local political traditions. Lastly, the Quebec National Question, poses some specific strategic and tactical problems to the Quebec left, namely: what kind of alliances to build with progressive non-French speakers in Quebec (Anglophones and immigrants) who are wary of its pro-independence stand? What kinds of alliances with Native Peoples? What kinds of alliances should be built with progressives in the rest of Canada (ROC)? It is an unfortunate fact that QS influence is presently very weak among non-Francophones (2% according to the latest polls, which is way below the QS province-wide average of 7-8%). While interesting positions have been adopted on this issue, it remains a question that the party must seriously tackle in the coming years. On the question of Native Peoples, Québec solidaire has adopted a position of full recognition of their right to self-determination. As for the question of links with ROC progressives, there has been no serious thought given to this issue as of yet. To sum-up, it is my contention that QS is similar in nature to the ‘left-of-the-left’ formations which we see rising in many parts of the world and it shares many of the challenges they face. Like many of these new formations, Québec solidaire is far from being a fully-set and hardened phenomenon. It is an evolving formation, with a program that has yet to be completely defined and a praxis which is still in a state of flux. How the party deals with the challenges ahead – the economic and environmental crisis, its relative electoral successes, the task of linking up with labour and mass movements – will go a long way toward defining its future and role in Quebec politics. Roger Rashi is a social and political activist living in Montreal. He is a founding member of Québec solidaire and presently sits on the steering committee of the riding of Mercier which elected Amir Khadir to the Quebec National Assembly in December 2008. He is also a member of Québec solidaire’s Working Commission on the Environment. The views expressed here are strictly his own. 1. In June 2007, Québec solidaire granted the status of “recognized collectives within the party” to Gauche Socialiste, an affiliate of the Fourth International and to Masse Critique, an anticapitalist and ecosocialist collective, to which I belong. Since then, two more collectives have been recognized: the Parti Communiste du Québec and Le collectif pour la décroissance, a zero-growth radical-ecology collective. 2. See the Leger Marketing poll published in Le Devoir on December 1st 2009. 3. See Alain Badiou “The Communist Hypothesis,” New Left Review, N. 49 (Jan.-Feb. 2008); and his The Meaning of Sarkozy (London: Verso, 2008).